The resolution test of the Tokina AT-X 116 PRO DX II AF 11-16 mm f/2.8 was based on RAW files from the Canon EOS 50D. 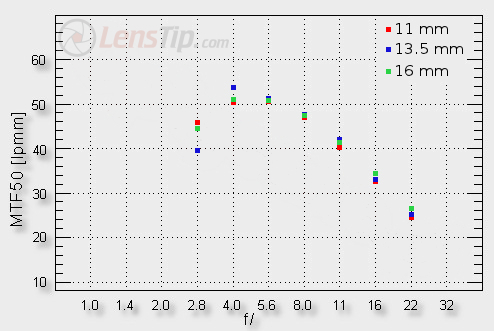 The maximum MTF values, reached with that camera by the best fixed-focus lenses, oscillate near 52-55 lpmm. The decency level we situated somewhere around 34-35 lpmm. Let’s check how the tested lens compares here, starting from the centre of the frame. As you can notice it can only be praised. 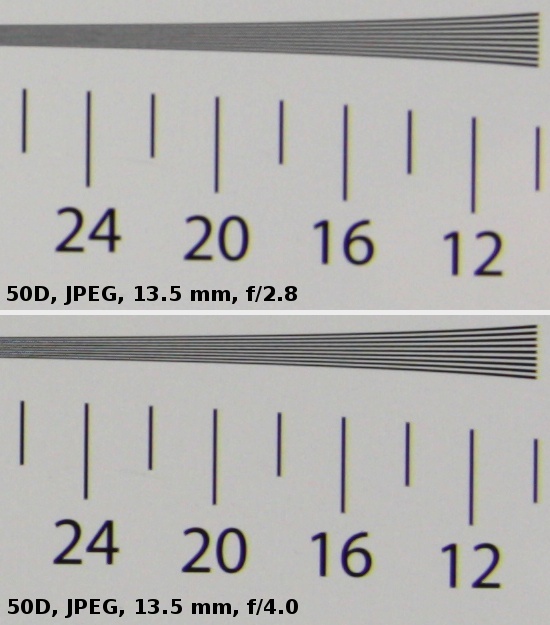 At the maximum relative aperture, for both ends of the focal length spectrum, you get MTFs as high as 45-46 lpmm which is a very good result. Even the lowest value in the centre of the range remains good, amounting to 40 lpmm so safely above the decency level. On stopping down the performance becomes simply brilliant – the lens doesn’t have any problems with reaching 50-52 lpmm and at 13.5 mm focal length it can even get as high as 54 lpmm which is almost a record-breaking value. Now let’s check the edge of the frame. 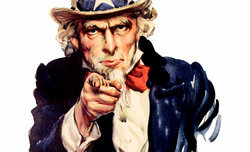 The situation is not as good as before. The performance is very even, that’s true, but at the same time, at the maximum relative aperture, all focal lengths provide images which are far from being fully useful. Only on stopping down to f/4.0 the image quality improves, becoming truly good from f/5.6 onwards. It is worth mentioning, though, that the most serious rival of the Tokina, the Sigma 10-20 mm f/3.5 EX DC HSM, also had problems with reaching the full usefulness at the maximum relative aperture; mind you the Sigma is by 2/3 EV slower. Taking into account the excellent performance in the frame centre and comparing the performance of the rivals, our assessment of the Tokina 11-16 mm II in this category should remain very positive. The crops below were taken from JPEG files saved along RAW files, used for the analysis presented above.